The latest Mac Pro® is an object of desire, but a lustrous finish hides its true beauty within—massive power. If you’re a pro user in the video or audio industries, the Mac Pro offers the power you need, but lacks the built-in expandability you count on. In order to achieve this engineering feat, Apple® designers stripped away components and space to a minimum, taking out PCIe slots and drive bays, and packed the remaining components into a small cylinder. Its compact size makes the Mac Pro more transportable and rackable, but prevents onboard installation of PCIe expansion cards. In addition, the computer still requires an enclosure to make it road- or rack-ready and provide convenient cable management. 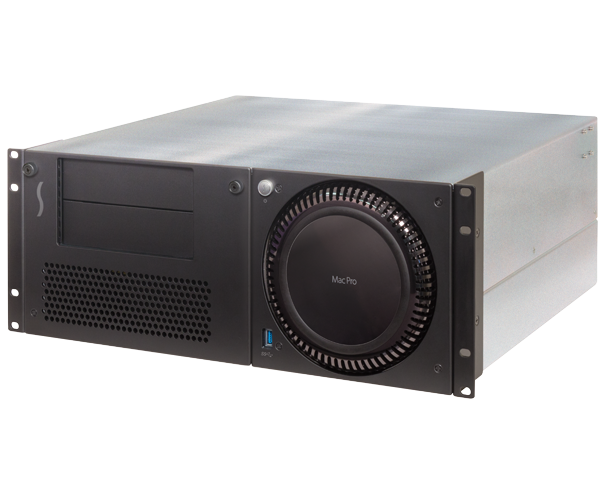 Sonnet’s xMac™ Pro Server PCIe 2.0 expansion system/4U rackmount enclosure addresses these issues and increases a Mac Pro’s potential in a big way. With amazing expansion capabilities, an easy to maintain modular design, and support for a wide range of popular mobile racks, carts and portable rack cases, xMac Pro Server is the perfect solution for expanding the power of your Mac Pro. Optional Mobile Rack Device Mounting Kits expand xMac Pro Server with peripheral expansion. Basic kit includes mounting bracket with 100W power supply and fan. Pre-configured kits include PCIe adapter card, plus cables and devices. Features three PCIe 2.0 slots, two Thunderbolt™ 2 ports, and an integrated, universal 300W power supply with 75W auxiliary power connector for cards that require supplementary power. Two mounting holes for BNC connectors allow the use of a RED ROCKET-X card without the need to install a BNC connector bracket that would normally occupy a valuable PCIe slot. Provides a protective steel "cocoon," covered with soft touch padding, that holds the Mac Pro firmly in place while protecting its mirror finish. Rear panel-mounted cables (power, USB 3.0, two Gigabit Ethernet, and HDMI) connect the Mac Pro to the back of the xMac Pro Server for convenient external connections. Mac Pro, Mobile Rack Device Mounting Kit drives, and PCIe cards featured in photos not included.